Canon T80, while the EOS 650 started Canon's new autofocus era, Canon actually had one autofocus camera before the EOS which used Canon's FD lens mount. 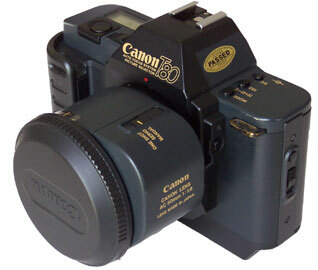 The Canon T80 was introduced in April 1985, about two years before the EOS 650. The design evolution from the Canon AE-1 (1976), the first camera controlled by a Central Processing Unit (CPU), to the Canon T80 (1985), to the Canon EOS 650 (1987), and finally to the Digital Rebel (2003) is apparent. Bodies became more rounded, automatic film advance was built in, autofocus motors were included in the lens, a larger lens mount to accomodate autofocus lenses was introduced with the EOS line, autofocus lens motors became smaller and more sophisticated, and finally, with the Digital EOS, the entire process became electronic eliminating film all together. Canon T80 AC 35-70 f3.5-4.5 lens. The T80 could use three Canon AC automatic focus lenses, a 50mm f1.8, a 35-70mm f3.5-4.5 zoom, and a 70-210mm f4.5 zoom. These all had Canon's FD lens mount and could be used on other Canon cameras with the FD mount in manual mode. 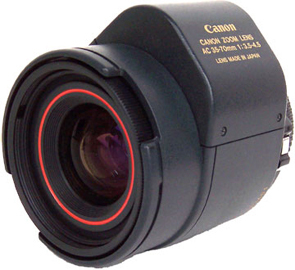 Also, any Canon FD mount lens could be used on the Canon T80 in manual mode. With the EOS line, FD lenses could no longer be used. My T80 was purchased on e-Bay for $12.06 with $8.00 shipping. The camera and lens are in excellent cosmetic condition. The camera was sold as broken, however, since the shutter does not fire. The camera takes 4 AAA batteries. The camera's battery compartment is very clean. 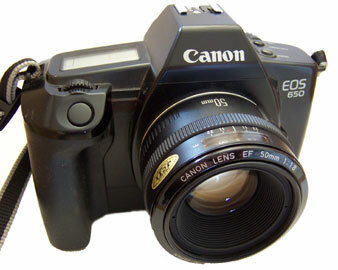 Canon EOS 650, the first camera in the EOS line. It was introduced in March 1987 and I purchased mine in May 1987. The Canon Camera Museum's presentation includes a rotating 3D image of the 650. Although the Minolta 7000 autofocus camera came out before the Canon EOS, Canon departed from other manufacturers by including the autofocus motors in the lenses, not the camera bodies. This combined with a larger lens mount on the camera body, meant that prior Canon lenses would not fit the EOS models. Canon believed the new lens design, however, increased autofocus performance and Canon has remained at the forefront of autofocus lens design. This is a wonderful camera still in excellent condition. I do not use it much now, however, because I prefer the light weight and built in flash of the Rebel 2000. The EOS 650 was purchased on the morning my first son was born and the first images are of his birth. Canon EOS 630 (Large Image) Introduced in April 1989, the EOS 630 is the third Canon EOS camera after the EOS 650 and EOS 620 which were introduced in March 1987 and May 1987 respectively. It is clearly based on the original EOS 650 and 620. The Canon Camera Museum describes it as "notch above the EOS 620 with faster AF speed." While it had a faster AF speed than the EOS 620, it shared the lower 1/2000 second maximum shutter speed and 1/125 second flash synch speed of the EOS 650. (The EOS 620 had a maximum shutter speed of 1/4000 second and a maximum flash synch speed of 1/250 second.) 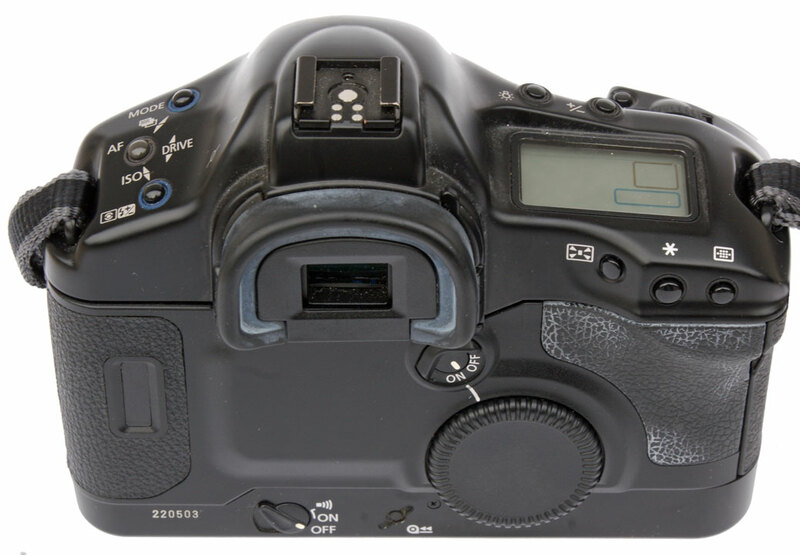 According to the specifications at the Canon Camera Museum, the EOS 630 also provided "seven Programmed Image Control modes with different combinations of AF, AE, film advance mode, and program mode." 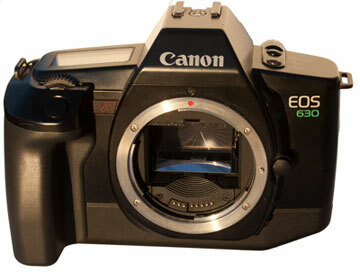 According to dpreview the EOS 630 cost about $900 in 1989. That is considerably more than the about $400 I remember paying in 1987 for my new EOS 650. Photography in Malaysia - Canon EOS Resources and EOS Documentation Project have excellent detailed information about the EOS 630. The owner's manual is available at butkus.org. I purchased my EOS 630 for $20 on December 22, 2011 in Escondido, California from an ad on Craigslist. It came without a lens, but included a carrying bag, strap, body cap and battery. The inclusion of a 2CR5 battery is important since the battery alone can cost around $10. The camera is in excellent working and cosmetic condition. 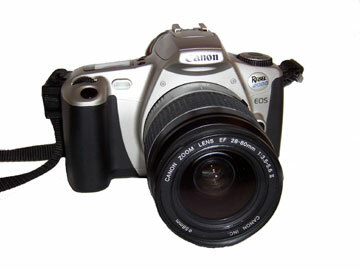 Canon Rebel 2000, a wonderful camera purchased new the summer of 1999. 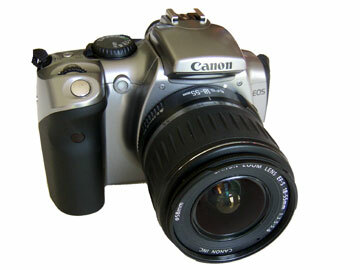 It is quite small and light compared to EOS 650 or Elan. It has a complete range of functions, including depth of field preview which prior Rebels did not have. It is in terrific working condition, although I don't use it as often anymore since I am taking more digital photos. I have numerous EOS mount lenses (Canon and Sigma) and other accessories. Canon Elan, introduced August 1991, this was the first camera in Canon's mid level, full featured, Elan line which continues today with the Elan 7N. Canon Camera Museum states the Elan was noted for its quiet operation. 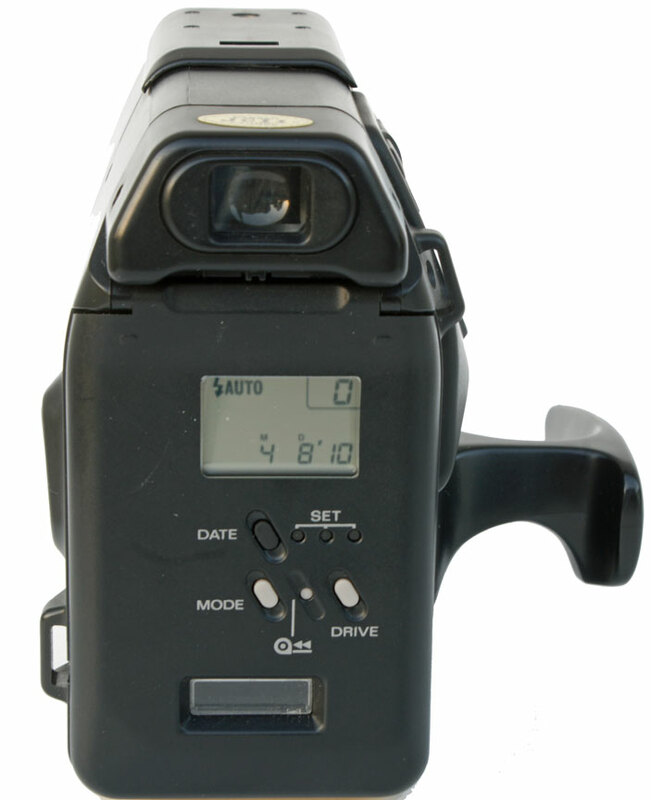 Unlike the EOS 650, it has a pop-up flash which adjusts for zoom lenses. It has a wide range of shutter speeds from 1/4000 to 30 seconds, with 1/125 flash sync, and depth of field preview. It also has mirror lock-up through its custom features. Mirror lock-up locks the mirror prior to taking the picture to prevent vibrations. This is useful to obtain very sharp close-ups and is often found only in professional level cameras. Film advance is up to 3 frames per second. 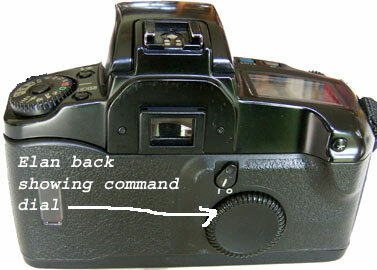 Another useful feature found on the Elan and higher level Canon cameras is the rear command dial. It can be used to adjust the aperture with your thumb making manual exposures much easier. It in effect puts the aperture ring on the back of the camera since EOS cameras do not have an aperture ring on the lens. While the Elan is a great camera, the Rebel 2000 satisfied my needs at a significantly lower price. I purchased this Elan used on eBay in February 2005 for $49 plus $10 shipping. It is in good working condition. It was purchased from a professional photographer who used it sparingly as a backup wedding camera. He had the shutter mechanism replaced by Canon after his young son punched his finger through the shutter! PhotoNotes.org has excellent information on EOS cameras including the original Elan press release and an Elan review. Canon Digital Rebel, introduced September 2003, the Digital Rebel was the first digital optical single lens reflex camera to break the $1,000 price barrier, with a initial street price of $899 for the body only, or $999 with an 18-55mm zoom lens (about 28-90mm 35mm equivalent). I use it frequently for sports photos since it has very little shutter lag, shoots at approximately 2.5 frames per second, and has a top ISO setting of 1600, great for indoor sports. It has a burst mode for up to four shots. Top resolution is 6.3 megapixels with JPEG and RAW settings available. It has the same sensor as the significantly more expensive EOS 10D. I bought my Digital Rebel new from B&H Photo in October 2004 for $815 with lens and a 1gb high speed Compact Flash storage card, after rebates. In March 2005, Canon introduced a new Digital Rebel XT that is 1/2 inch smaller, 3 ounces lighter (due to a smaller battery) and 8 megapixels. It also has a faster startup time. The street price with lens is $999, which has caused the prices of the original Digital Rebel with lens to fall to around $750. I have included the Digital Rebel in both the autofocus SLR category and the digital camera category since it is both. The look and feel is very similar to EOS film cameras. It has several advantages over film cameras since you can shoot about 300 high resolution JPEG images on a 1 gigabyte CompactFlash card - there's no film to change. You can switch the ISO from frame to frame. You also can see what your image looks like on the back of the camera after you take the photo. The lens that comes with the kit is for the digital camera only - it will not fit film cameras since it will protrude too far into the camera. The Digital Rebel will accept all EOS lenses, however. Since the film sensor is smaller than a 35mm frame, the effective focal length is increased by a factor of 1.6. This is both positive and negative. It effectively gives me fast, telephoto lenses. For example, it makes my 70-210 f4 zoom effectively a 112-336 f4 lens. A lens for a film camera with that range and maximum aperture would be very expensive. On the downside, the 1.6 factor limits the use of wide angle lenses. 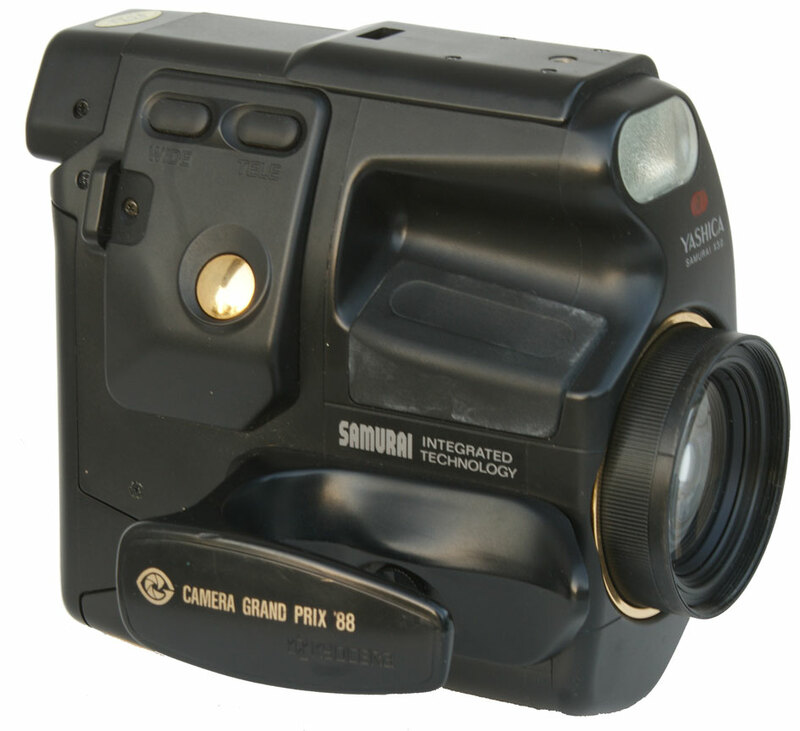 At the time the Digital Rebel was introduced, optical digital SLRs did not display the image electronically before the image is taken and as did not have video modes. Both "live view" and video modes are common as of 2010, however. 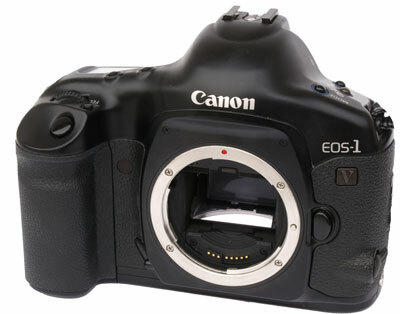 Canon EOS 1V (Large Image, Back) (2000 to current) the EOS 1V is Canon's last professional film camera and represents the pinnacle of 35mm SLR film camera development. The Canon USA Support page for the EOS 1v states: "The ultimate in professional vision with the world's fastest AF, and a continuous shooting speed of up to 10 frames per second, the EOS-1v continues the Canon tradition of advanced features and exceptional speed in a rugged, reliable package. The EOS-1v has more customizable features than any other Canon 35mm SLR: a 45-point AF system, 100% viewfinder coverage, a top shutter speed of 1/8000 sec., a flash sync of 1/250 sec., 21-zone evaluative metering, E-TTL auto flash, full-time depth-of-field preview, and much, much more." It has a rubber covered magnesium body with 72 gaskets for dust and moisture resistance. The Canon page adds that " the EOS-1V HS adds Canon's Power Drive Booster PB-E2 for even more speed." The power drive booster increases the frame rate from 3 frames per second to 10 frames per second, an incredible accomplishment especially for a film camera. I do not have the power drive booster. According to the Canon Camera Museum it was originally marketed in March 2000. In spite of explosion of digital SLRs in the last ten years, the EOS 1V is still available new as of 2011 at B&H Photo and Amazon for $1,699.95. 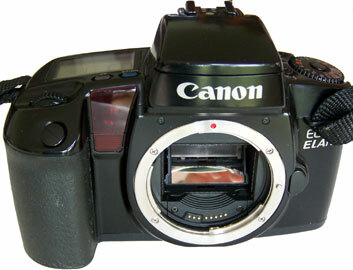 Used on eBay the EOS 1V body sells for several hundred dollars. I was very lucky to get mine in excellent cosmetic and working condition for $50 in the Point Loma area of San Diego from an ad on Craigslist on December 26, 2010. It came with the manual and a body cap. It takes a 2CR5 battery 6 volt battery. The seller is a very interesting chemical engineer, journalist, software designer, mountain climber, sailor and author! I also purchased a Nikon F from him as well as a Commodore 64 computer that was originally his daughter's and with which he started a real estate software company. After I told him about my Web site, he also gave me a HP 45 calculator, Hewlett Packard's second scientific calculator model, which he bought while a graduate chemical engineering student at Michigan State University. Part of the joy of collecting technology and doing this Web site is not only getting to see and use wonderful pieces of technology, but also getting to meet the fascinating people who used them. 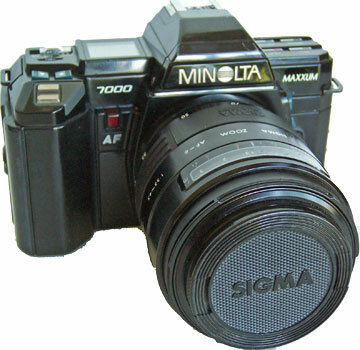 Minolta 7000 (1985) from the "minds of Minolta," (a trademark of Minolta) the first successful autofocus SLR system. See Photography in Malaysia. Minolta the same year also introduced the lower end Minolta 5000 and the higher end Minolta 9000. (Pentax introduced the autofocus ME-F earlier than the Minolta 7000. Pentax produced only one camera model and lens, however, and the lens was bulky with both the autofocus motor and battery in the lens. It was not a success and Pentax continued later with another autofocus system. See Wikipedia, Pentax K Mount.) For further information on the 7000 see Wikipedia - Minolta Maxxum 7000, Camerapedia - Minolta Maxxum 7000, Australian Photography - Minota 7000 Review. The manual is available at Photography in Malaysia. Minolta has been making cameras since 1928 and in 2003 merged with Konica, which traces its photographic roots back to 1873. (See Konica Minolta History). Sadly, Konica Minolta announced in January 2006 that it was quiting the camera business - both digital and film. Camera assets were sold to Sony, which will continue to use the Minolta AF mount in digital SLRs it produces. (See Konica Minolta Camera and Photo Support, Wikipedia - Konica Minolta, Konica Minolta 1-19-06 Press Release.) A wonderful display of over seven decades of Minolta cameras is Photoclub Alpha - Minolta History - Seven Decades. My first camera was a Minolta 600-X, 126 film camera. I purchased a Minolta Weathermatic Dual 35mm waterproof camera in 1989. The museum has an extesive collection of Minolta 126, 110, 16mm still, 35mm, movie, and APS cameras, as well as a Konica C35AF, the world's first autofocus 35mm camera (non-SLR). I remember using a Minolta SRT 101 which belonged to a relative in about 1976. I also remember considering purchasing a Maxxum 7000 in about 1986 at Target, but I held off and got the Canon EOS 650. I have since acquired several manual Minolta SLRs. My Maxxum 7000, my first Minolta SLR, was purchased on e-Bay on 5-20-06 for $22.50 with $8 shipping. It is in good cosmetic and working condition. Both the viewfinder LCD and the LCD on top of the camera are fully functioning with no "bleeding." Shutter speeds and light meter appear to be accurate. I shot a roll of film with it and everything worked well. The camera uses primarily buttons instead of dials. The layout of controls appears logical and easy to use. It uses four AAA batteries, a nice touch to cut down on battery expense. I do not believe it has a depth of field preview, however. I bought from another seller on eBay on 5-16-06, a 28-70mm, f3.5-4.5 Sigma lens with Minolta AF mount for only $.99 with $10 shipping for that lens and two others for other cameras. I think the low price was because they weren't sure it was a Minolta mount and did not know the operating condition. It is in great working and cosmetic condition. In 2005 I purchased on eBay for about $10 including shipping a Sigma 75-200mm, f3.8 lens in good cosmetic condition except for wear to some of the lettering. The glass is clean and it works well except the distance scale is off. To focus at infinity you have to go past the infinity mark and sometimes it gets stuck at the infinity mark. Still a great deal for a fixed f3.8 lens. The seller did not know what mount it was and neither did I until I got the Minolta 7000. Therefore, for about $45 I have a complete two lens Minolta 7000 system! My Minolta system greatly expanded when I purchased 4 lenses, a flash, cable release and L.L. Bean gadget case at a La Mesa, CA garage sale on 5-19-07 for $150 (also included two old phones). The lenses are (1) Minolta 28-85mm f3.5-4.5, (2) Minolta 50mm f2.8 1:1 Macro, (3) Minolta 70-210mm constant f4, and (4) Tokina 100-400mm f4.5-6.7. All lenses appear to be in good condition and would work with a Sony A-100 digital SLR with optical image stablization in the camera. The women had used the lenses on a Maxxum 7000, but it broke. She bought a new digital camera that did not use interchangeable lenses. $150 is a lot of money for a garage sale, but looking on eBay, many of these lenses go for over $100 each. The flash is a Minolta Maxxum 2800 AF in good working condition. The shutter release is a Minolta RC-1000. 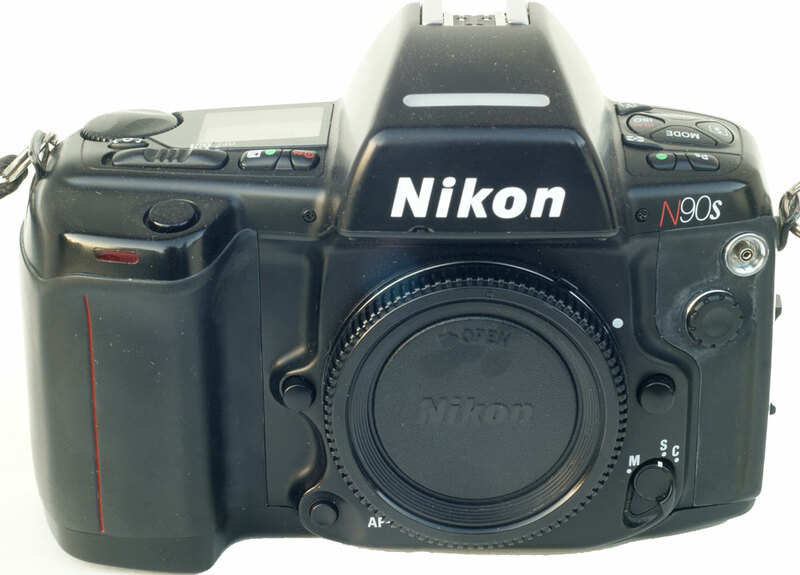 Nikon N90s (Large Image) (1994-2001) Designed for the advanced amateur. Called the F90x outside the United States. Preceded by the N90 (1992-1994) and succeeded by the Nikon F100 introduced in 1998. Cross-Type Wide Area AF System. Shutter speeds from 1/8000 second to 30 seconds. Flash synch 1/250 second. Auto film advance at more than 4 frames per second. Matrix, center and spot metering. Runs on 4 AA batteries. Camerapedia notes the following limitations for an advanced camera: no mirror lock-up, no built-in flash, no viewfinder diopter adjustment. It was an expensive camera. The price tag on the box mine came with was $948.86 with a copyright date on the box of 1994. Adjusting for inflation, the price would be $1,380.99 in 2009 dollars measured from 1994. I acquired mine from an ad on Craigslist on 7-13-09 for about $30 in Carlsbad, CA. (A FM2 and an N90s for $70 total.) It is in very good cosmetic and operating condition. No lens included. I previously acquired another one, with as I recall a 28-90mm zoom lens, about two years before for about $50 in the Clairemont area of San Diego. It is in good working condition with cosmetic signs of wear. 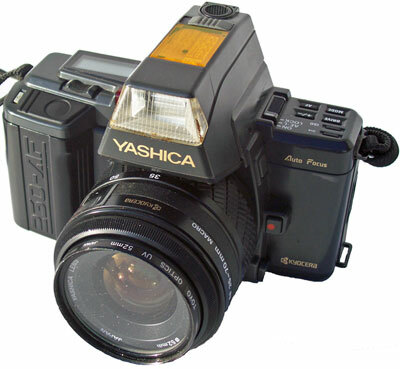 Yashica 230-AF (Large Image) (February 1987 to March 1990) (Dates from History of Yashica/Contax/Kyocera Cameras.) Purchased at a garage sale on 5-12-07 for $25. In good working and cosmetic condition although I can't get the flash off and I can't get the flash to work. I may be doing something wrong, although user reviews indicate that flash malfunction is not uncommon. The other common complaint is the limited availability of lenses. Includes instruction manual. 35-70mm f3.5-4.5 lens. The history of Yashica is explained at camerapedia. 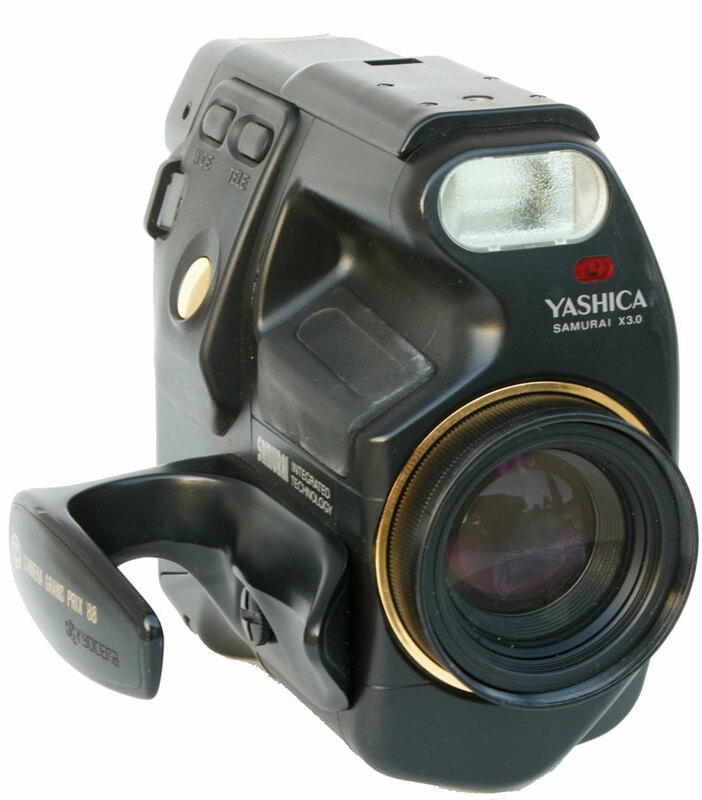 Yashica was acquired by Kyocera in 1983. According to the above camerapedia article and the Wikipedia article on Kyocera, Kyocera ceased production of all film and digital cameras in 2005. Yashica Samurai X3.0 (Large Image, Other Side, Back, 3/4 View) (Commenced 1988) A unique camera. While it doesn't look like it, it is a true single lens reflex camera. It's autofocus. It's point and shoot. There are no manual adjustments of shutter speed or aperture, although shutter speeds range from 2 seconds to 1/500 second and maximum aperture is from f3.5 to f4.3. There are various automatic modes. Finally, it's a half frame camera with 72 photos available on a 36 exposure roll of 35mm film. It therefore could also fit into the subminiature portion of the Camera Museum but it fits here nicely also since it is clearly an autofocus SLR using 35mm film. Zoom lens has a focal length of 25mm to 75mm which translates to the same field of view as a 35 to 105mm focal length on a full frame 35mm SLR. The shutter button and other trim came in various colors. Mine is the Grand Prix 88 model with a gold color shutter button and trim! A hot shoe accessory could be added to use an external flash. Once I added a new 2CR5 6 volt battery (less than $4 through Amazon) it worked great. I purchased it at the Thrift Coral in La Mesa, CA (benefits Grossmont Hospital) on April 5, 2010 for $8 after coupon with tax extra. It also came with a case made for it, Samurai X3.0 Hard Case SM-B2. It took me awhile to figure out that the camera will only go back into the case with the lens pointed down. 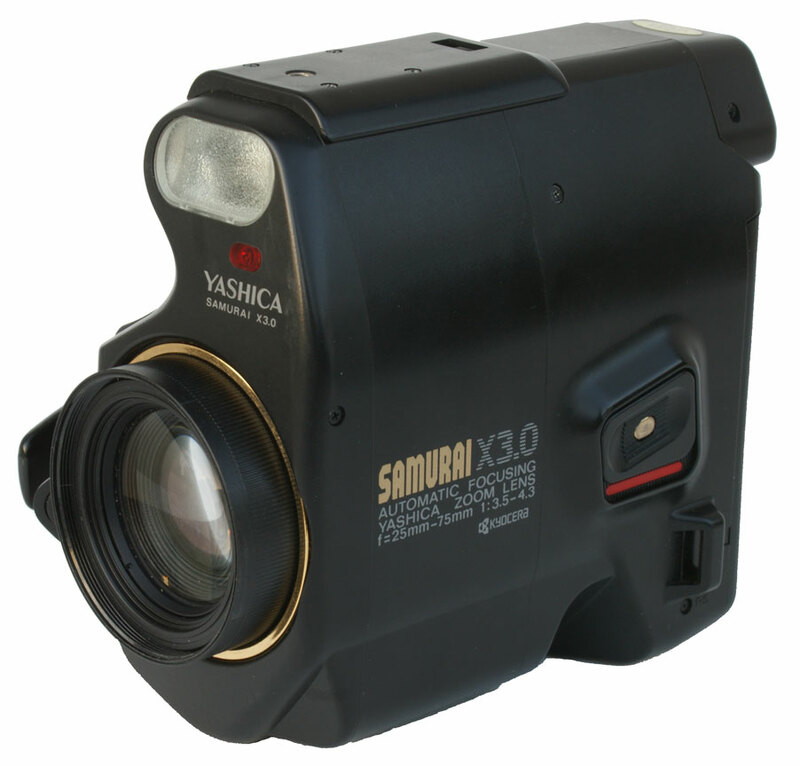 More information on the Yashica Samurai X3.0 is at Subclub.org.